The students were guided by teachers Jinky C. Artillero and Krizzalyn C. Barrios. Congratulations to the winners! To the other contestants, use this experience to better prepare for next year’s competition. This entry was posted in High School, MSC, San Pablo City and tagged Allen Ashley Alcos, Alliah Joisel Patulot, Decerie Tulipan, Division Press Conference, Hazel Garinn Villanueva, Jinky C. Artillero, Krizzalyn C. Barrios, Lady Chaniyel Millares, Liane Jane Sarmiento, Lovynel Cortrez, Mikkel Franz Angeles, Rica Mae Comia on November 28, 2014 by Jose Adonis Duma. It sounds a bit cliché but high school had indeed been a roller coaster ride for me. I fell in love, got my heart broken, fought with friends, made up with them, failed a test, aced one, and so many more memories that made me felt that I was on top of the world and even on the edge of it. For years, I’ve been wanting a reset, to undo the things I regret and make things right. It wasn’t until many years later that I realized that everything I am now is a product of those four years of my life, and I wouldn’t want to change a thing. Enjoy high school, every single day of it. In college, everything will not be the same. If you go to a university, the only people you would probably talk to is your seat mate. You won’t get as much interaction with your teacher. When you graduate and start working ,you would find yourself alone and longing for social interaction, and that’s when you’ll find yourself wishing you kept in touch with your friends from high school, so it wouldn’t be awkward to just randomly ask one of them out for coffee. I’ve lost contact with some of my closest friends and now, they are strangers to me. I no longer know anything about their life, except for what they post on Facebook. Part of the reason that we drifted apart was I fell too much in love with my high school sweetheart that anything that reminded me of him then hurt me so much, I got rid of every high school memory I had, even if that meant losing friends of mine. It seems a bit silly now but after all is said and done. My advice to you is to keep the people with you closest to your heart. Move on from high school but not from your friends. Fall in love but keep yourself and your world intact. Cherish every mistake and triumph, and share them with people you care about the most. Soon it’ll be your turn to share some of your high school memories, and what you’ve learned, so go ahead and enjoy the ride. Let me know how things play out. 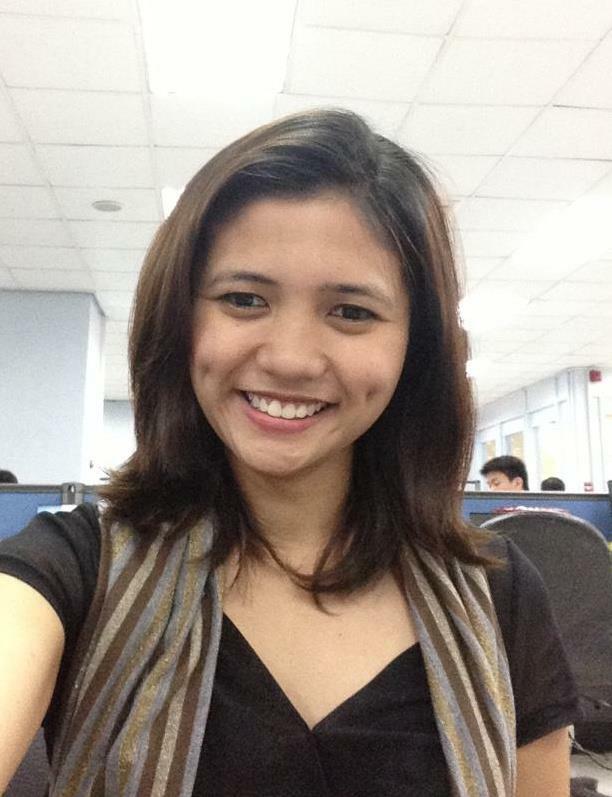 This entry was posted in Alumni, High School, History, MSC and tagged Joan Miranda, manila water, MSC, UPLB on November 28, 2014 by Jose Adonis Duma. 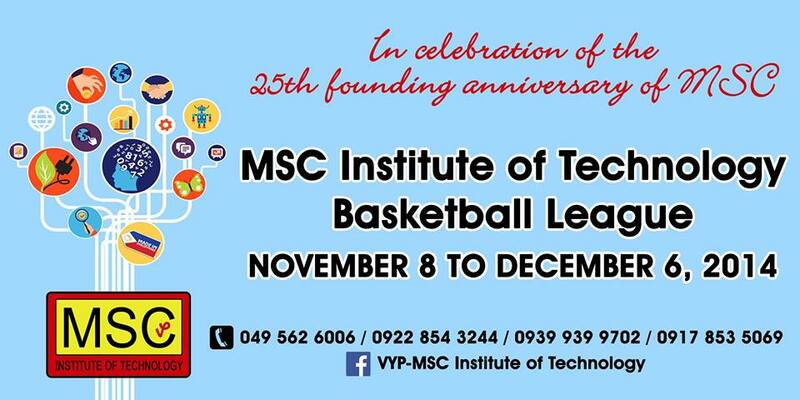 The MSC Annex was the “home” of MSC for 16 years and it has been the site for a lot of activities participated in by the students, faculty, and staff. Many people, even those not involved in the school, visited the place for the various events. 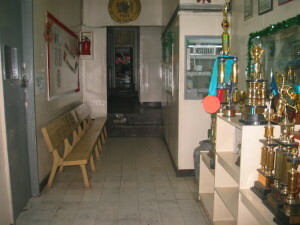 During MSC’s stay at MSC Annex, the site was used as Quick Count Headquarters in several elections. MSC would join quick counts with other civic groups. Partial results were brought to the headquarters where encoders tally the votes using a program developed by MSC. There was even a time when a big screen was put outside, showing partial unofficial results for the public to view. For one week during the San Pablo City fiesta celebrations, Rizal Avenue is transformed into a party zone with stalls selling food and drinks. In major intersections, stages are set up for the performance of different bands and entertainers. 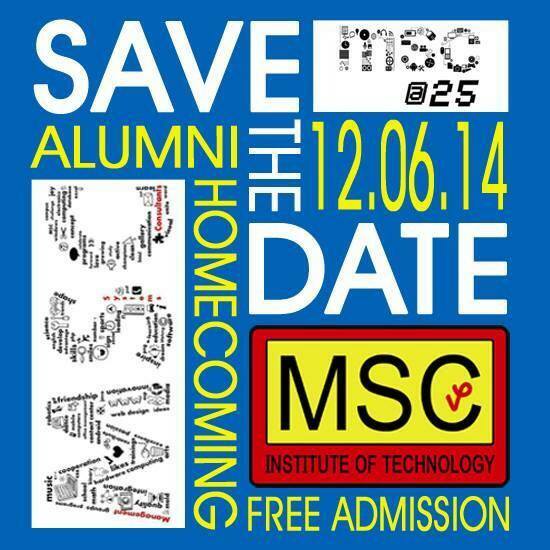 Being near the plaza, the MSC annex was also used as venue for the festivities. A makeshift stage would be put up in front of the building for performances by MSC students. Every summer, MSC Annex turned into a center for students from different schools who enrolled in Music lessons and review classes. The late Val Tomas and his assistants taught young children the basics of their favorite instruments. These students would be grouped and Sir Val would supervise their practice with students playing individual instruments together with a band. A recital at the end of the summer sessions always drew huge crowds of proud parents. Sir Val would have been very satisfied knowing many of his protégés are doing well in the entertainment scene. Being a computer school, computer lessons would always be a part of the classes offered by MSC whatever time of the year it may be. Courses range from computers for kids, computer operation, programming, and web design. Special classes were also offered like computer operations for teachers. For incoming freshmen and for those wanting to improve their academic performance in the coming schoolyear, MSC annex was venue for review classes. Even in the early years of MSC, Sir Ike personally tutored many students, especially children of friends. With the review classes at MSC Annex, more students had easy access to this facility. 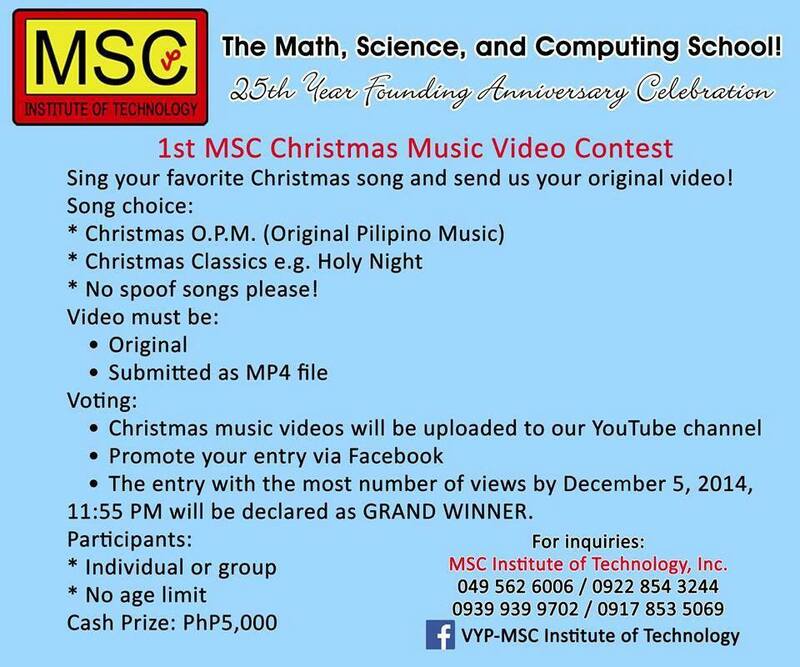 This entry was posted in Events, History, MSC, San Pablo City and tagged computer lessons, music lessons, Quick Count Headquarters, review classes, San Pablo City Fiesta stage, sir val, summer lessons venue, val tomas on November 28, 2014 by Jose Adonis Duma. express the measure in centimeters. divide the number of centimeters by 30 to get the number of feet. Again, we used 1 inch = 2.5 cm instead of the exact 1 inch = 2.54 cm. To make it more accurate we could deduct 0.5 cm per foot from the remainder of step B to make the conversion more accurate. 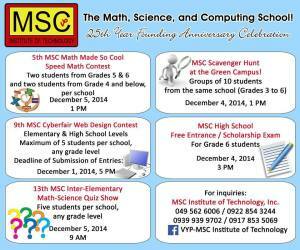 This entry was posted in MATH-Inic, MSC and tagged conversion of meters to feet and inches, Math short cuts, MATH-Inic, mathematics, memory techniques on November 28, 2014 by Jose Adonis Duma. The first teachers were Ms. Emelyn Aningalan-Buenaseda, Ms. Grace Bayubay, and Ms. Merlie Javaluyas with 30 students attending the morning session. The evening session started in August, 2002 with 31 students. This entry was posted in History, MSC, Technical-Vocational and tagged Abigail A. Pasco, Arnel M. De Leon, Caregiver, Caregiving Course, Castor Nuque Jr., Celeste C. Enriquez, Christe B. Cosico, Chrizel C. Cosico, Cristeta L. Montegudo, Dondon B. Belarmino, Grace M. Polinag, Harold H. Morcilla, Jeanne Melissa R. Sibug, Jenny Anne T. Arceta, Joan C. Arellano, Larry M. Dela Cueva, Madelou R. Del Mundo, Marjorie Salvacion, Mark Marvin B. Maghirang, Melanie M. Bigol, Milanda V. Castro, Resy M. Canayunan, Resziel C. Alvero, Rexford Bagsic, Rhena S. Badayos, Richard De Lima, Robert O. Copada, Romeo A. San Diego, Rosalie Tagulao, Sharon F. Quijano, Teresita N. Navarro, Vivien P. Azucena on November 28, 2014 by Jose Adonis Duma. Remember that the right hand side has the same number of digits as the number of zeroes in the base. It is good practice to use the smaller deficiency as the subtrahend. It is definitely easier to subtract 2 from 6,879 than to deduct 3,121 from 9,998. 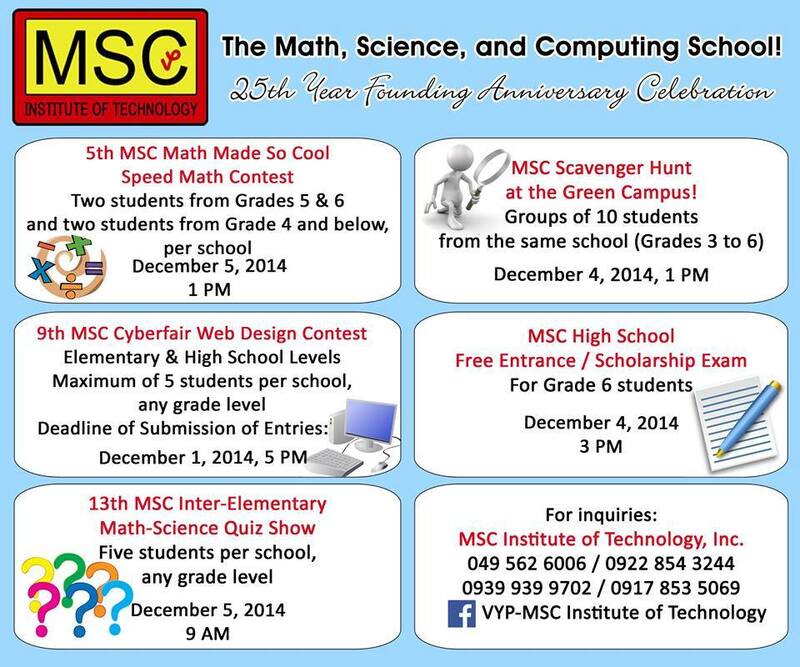 This entry was posted in MATH-Inic, MSC and tagged 25 MSC, Math short cuts, math shortcut, MATH-Inic, mathematics, memory techniques, multiplying numbers below a base on November 28, 2014 by Jose Adonis Duma. An MSC graduate is now making waves on primetime national TV! 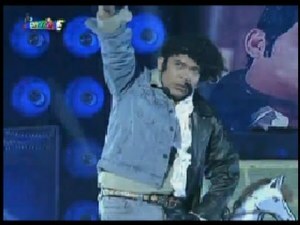 Erwin Ciar, a graduate of MSC’s Computer Technology Course in 2002 won in PinaSikat, a segment in the popular noontime TV show Showtime. When MSC initially rented the old Agrix supermarket building, also known as MSC Annex, it had two classrooms and an office on the second floor; a computer lab, and two classrooms, and a small office on the first floor. The building was actually the front part of the Bunquin family compound. 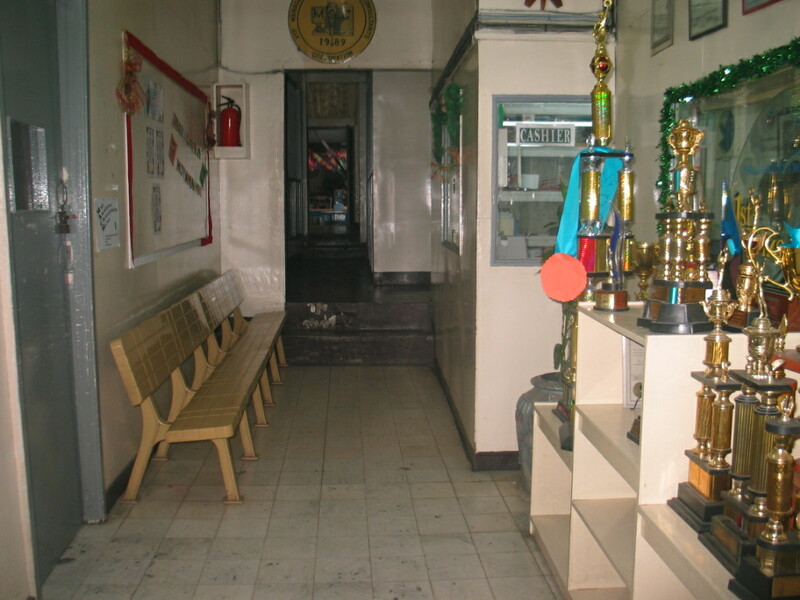 By June 1996, this building was used by the first three classes (1st to 3rd year) of the MSC High School. Pagpasensyahan nyo na po…. Galing po ako sa mahirap na pamilya, kaya noon, wala na ako pag-asa makapag-college… Salamat na lang may MSC, nakapag-aral ako at sa tulong ng naging amo ko sa Tiaong. 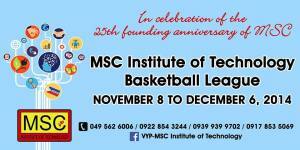 In 1991, MSC’s first batch of two-year course students totaled more than 70. Even with a group this small, the students organized clubs as well as a student council. Of course there had to be elections for the student council officers and being in a computer school, the students themselves created a program to count the votes! Most of us have learned by heart the multiplication table up to 10 x 10. A simple technique will enable us to extend our multiplication power up to 20 x 20. Cover one of the ten’s digit and add what remains to the other number: 14 + 2 or 4 + 12 will both give 16. This will be the first or left hand part of the product. 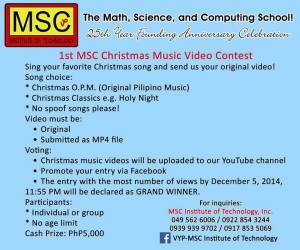 This entry was posted in Alumni, High School, History, MATH-Inic, MSC, Newsletter, San Pablo City and tagged 25th MSC Founding Anniversary Celebration Updates MSC Alumnus Erwin Ciar makes it to PinaSikat Grand Finals MSC Story Part XI: Stories at the Annex Stories from the Alumni: from Sammy Suco MSCs First:, Conversion: Feet to Meters, edwin ciar, Multiplication, Multiplying Teen Numbers and Others, pinassikat, Sammy Suco, showtime on November 28, 2014 by mscadmin. He won in the daily and weekly rounds of the contest which highlights different talents of Pinoys. His performance dubbed “D Kings” features himself as a two-faced (“doble-kara”) man – Fernando Poe Jr (FPJ), “The King” on one side and Romy Diaz, the “Contrabida King” on the other. Erwin had the audience laughing throughout his impersonation of the two kings. He even elicited a standing ovation from two judges, Maxene Magalona and Jong Hilario. When he was at MSC, he was president of the Student Council. 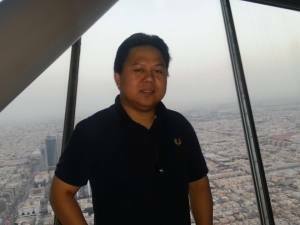 He worked as Dance Insructor in San Pablo City and was General Manager of a resto park in Laguna. These days he accepts hosting jobs and offers variety show packages. Being a finalist at PinaSIkat, he already won thirty thousand pesos and he has a chance to win the grand prize of one million pesos in the finals in December. Best of luck, Erwin! Balato naman dyan…Nyahhhhhh…. 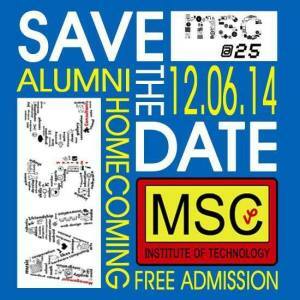 This entry was posted in Alumni, MSC and tagged contrabida king. The King, D'Kings, doble kara, Erwin Ciar, Fernando Poe Jr, jong hilario, maxene magalona, PinaSikat, Romy Diaz, showtime on November 28, 2014 by Jose Adonis Duma.